Warning: these are highly addictive and way too easy to make. I’ve been meaning to post these for awhile… the problem is that every time I’ve made them we just eat them. There’s a lot of restraint involved in taking pictures of food. 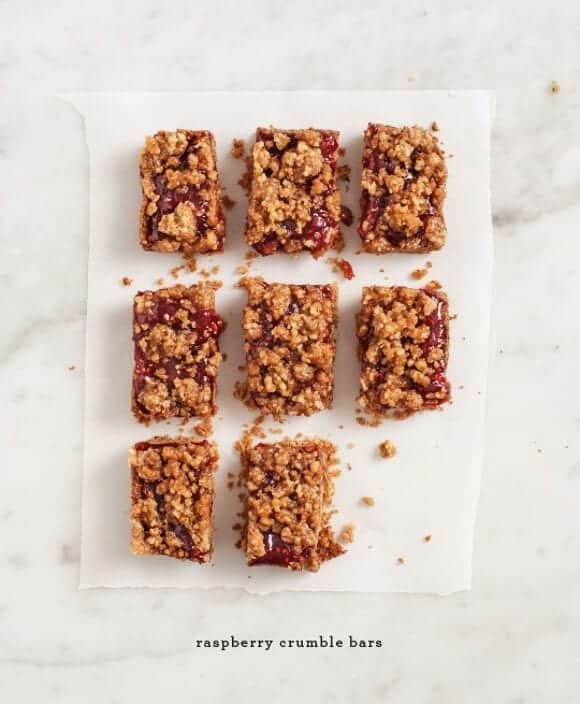 These are inspired by one of my favorite treats – those raspberry bars at Whole Foods (the super delicious buttery ones). 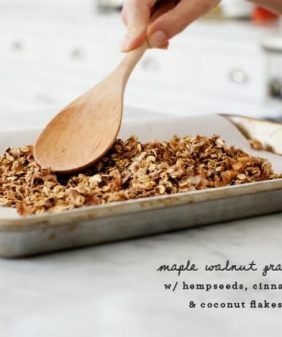 My version here uses coconut oil and walnuts which makes them a tad healthier although they’re still pretty indulgent. A perfect little 3 o’clock snack. You likely have all of these ingredients in your pantry already. I used store-bought raspberry jam, nothing fancy. (In the summer I might try fresh fruit). I used spelt flour, but regular or whole wheat flour would be fine. If you’re gluten free, try gluten free oat flour. Preheat oven to 350 and prepare a 5x7 baking dish (or equivalent size) with parchment paper. In a food processor, pulse together the coconut oil, flour, walnuts, brown sugar, cinnamon, and salt until it’s crumbly like wet sand. Take ¾ of the crumbly mix and press it into the bottom of the pan. Bake the bottom crust for 10-15 minutes or until the edges turn lightly golden brown. Remove from the oven and let cool. If necessary - add a tiny bit of water to the remaining crumbly mix (which will be your topping), and mix it gently with your hands so it forms thicker crumbles. When your crust is cool to the touch, spread a layer of raspberry jam, and crumble on the topping. Bake for an additional 10-12 minutes. Let cool, carefully lift out parchment and slice. If you're coconut oil is liquid or soft, pop it in the fridge for a few minutes and it'll harden. If your crumbly topping is more goopy than crumbly, chill it for a few minutes and it'll become more cohesive. I love how simple these are, perfect for wishing away the winter! Can’t wait to try these! They look so lovely. 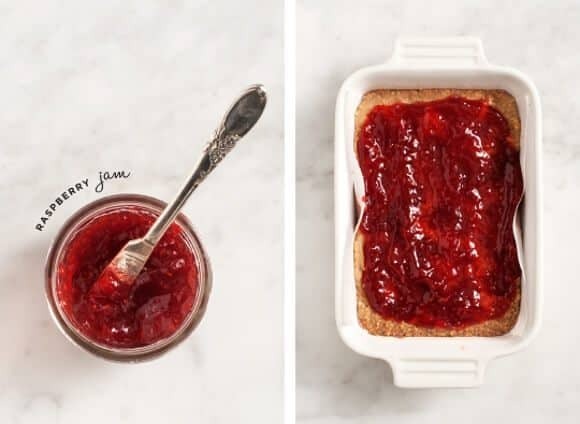 Do you have a favorite raspberry jam? Holy, these definitely look highly addictive! So yummy sounding! Oh man! I could eat a whole pan of these bars right now. Experiencing major sugar cravings today, send help. Or raspberry bars. Aw man these look delicious, I want to eat one through my screen right now! do you think these would work as a school lunchbox snack? or a tad too soft and mushy (and delectable!)? hmm, I guess it would depend on how much that lunchbox gets shaken around 🙂 The crust is a little crispy, not completely mushy, cohesive, but still sort of delicate. I’m sure the crumbs would at least be delicious! Haha thanks Jeanine. I am sure the lunchbox will probably be shaken around more than most, as it belongs to my 5 yr old boy. You’re right – these DO sound super easy and I doubt I’d have the patience to take photos of them before devouring a couple. Pinning! I think these need to make an appearance in my kitchen tonight. You’re right, I do have everything on hand to make them – hooray! Oh man! I would probably just eat the pan with a fork and not even bother to cut them. ahaha! so excited to try this! it looks amazing! Definitely need to try the gluten-free version! Love raspberries! Delish! These are exactly my kind of treat. And so simple too! Oh, these are dangerous! 7 ingredients? Yeah, too easy. Definitely making soon! 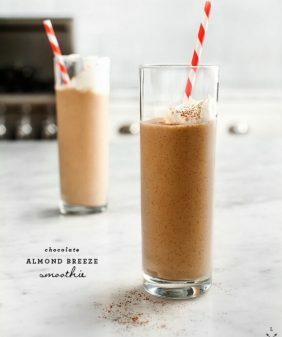 will be making them once im done with whole30.. I love fruit crumbles! They are so much easier to make than pie crust. I made one with fresh blueberries a few weeks ago, but I love the idea of using jam! Just made these bars and they are amazing. Used whole spelt flour and I love the hearty nuttiness from the flour and walnut combo! And this was by far the easiest baking project I’ve done. glad you liked them, thanks!! Is there a way to make this nut free? These look amazing. I am a huge raspberry fan, and don’t bake unless it’s super easy. My only problem is our nut-free house. Do you have a suggestion to replace the cup of walnuts? I just had a Raspberry Crumble Bar from Cheryl’s Cookies based in Columbus, Ohio. Oh my gosh…I haven’t been able to stop thinking about it. Thanks for this similar recipe. Looks delicious and I love coconut oil too!!! Is there anyway to find the nutrition facts on your recipes? I want to try so many of them but am curious of calorie count, sugar content, etc. Thanks! Hi Hailey, I don’t do nutrition facts but if you google for a calculator, tons pop up. (these nutty recipes are probably a bit calorie dense – you could cut back the sugar here a bit b/c the raspberry jam is very sweet). 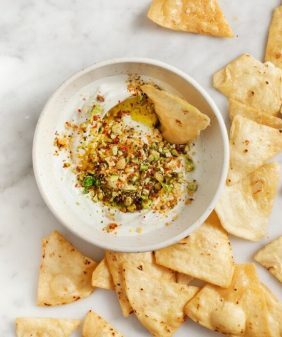 Tried this recipe last night and LOVED them! Just made these tonight, and they are delicious! I made individual bars and used both strawberry and apricot jams—the apricot is great with the nutty and saltiness of this. I was worried that I misread the 1 tsp of salt, but it makes the flavor of this. I love how complex and deep the flavors go in this, plus the coconut oil made my apartment smell great! 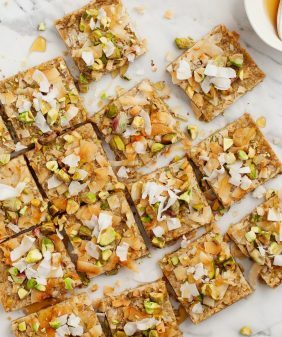 These look really yummy and I have the ingredients to make them but really a 5 x 7 pan? yep – absolutely – go with the whole wheat pastry flour. Yay thank you! Making them tonight! Looks delicious! We didn’t have walnuts so we used pecans instead! We also combined strawberry jam, fresh raspberries and orange zest to make the filling as well as added nutmeg and orange zest to the crumble. The results were incredible! sounds delicious – yum! Glad you liked it and were able to customize! Can I make these with a substitute for the raspberry jam? Also, can I use a different kind of sugar rather than the brown sugar or is that the only one that works? Do you think these would work with a chia seed jam filling? They are, as everyone says, delicious. I baked up a batch and they were devoured in a matter of hours. I made another batch the next night: same deal. Also just wanted to say that I cook and bake regularly using recipes from various online sources (NY Times Cooking, Cookie and Kate, Minimalist Baker, etc.) and yours have consistently given me the best results. The molter chocolate cakes — so, so good. My partner said it was the best thing he’d ever eaten. I made these two months ago and it’s a popular request among family and friends since then. Thank you for sharing this delicious recipe! 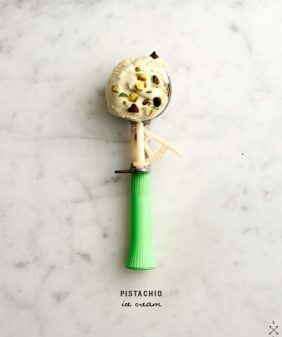 Would you ever consider a publishing a book of your dessert recipes? I’ll be the first to say I would buy it (already have your cookbook :0)). 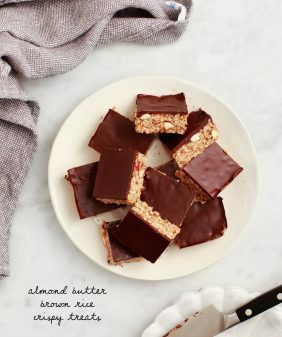 Made these delicious bars! The mix wasn’t exactly wet sand tho and didn’t toast in the oven a lot. And how do you get the jam to spread so evenly and nicely ??? It seems my mix was too try despite adding water. Hi D, I’m glad you loved them! It sounds like you could still add a bit more water if the crust was dry… and possibly bake the crust a tad longer for it to firm up more?